Camomile Cottage is a 16th Century timber framed Suffolk longhouse providing luxury 4 Star Bed & Breakfast accommodation. Chobbs Barn provides romantic self catering accommodation. We believe the family dog is just that, a member of the family and deserves a holiday too! We have a Labradoodle called Fozzie and wherever we go, if we possibly can we try to take her with us. We believe that if you have a clean, well-behaved dog and you want them to join in the family holiday, you shouldn't compromise on quality when it comes to your holiday cottage accommodation. 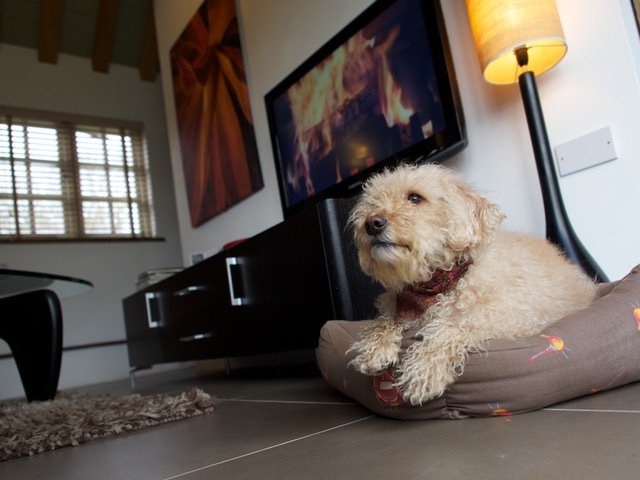 The vast majority of luxury self catering properties in the UK don't accept dogs - but we do! Of course just like their owners, we have house-rules for our pet guests, but they are just what you would expect in a luxury holiday cottage - such as not being allowed on the sofa or bed! We are also respectful of the fact that many of our guests don't have pets, so don't want to know that a pet may have stayed at the barn before them. For this reason, alongside our house rules for pets, our cleaning standards are very high, so you shouldn't be able to tell a dog has stayed before you. We are very happy for you to have your pet accompany you on holiday, but it is under the strict understanding that you adhere to our booking conditions relating to the acceptance of a dog to Chobbs Barn. Your pet must be at least 1 year old and house trained at the time of your holiday. We recommend that you bring plenty of your pet's bedding and towels with you, feeding and water bowls and poo bags, as we don't supply them at Chobbs Barn.